Featuring illustrated tutorials for drawing 75 different animals, Ten-Step Drawing: Animals breaks down each subject into 10 simple steps; moreover, all you need is a pen or pencil and a piece of paper! About the Author: Heather Kilgour is a London-based illustrator who specializes in children's books. Heather was the featured illustrator for Words & Pictures online magazine and is a member of the Society of Children's Book Writers and Illustrators' Illustration Committee. Learn more at http://heatherkilgour.com. 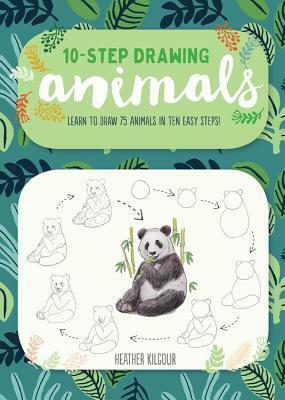 My Review: This is a great book for all ages to learn to draw in 10 easy steps. Each animal has easy to follow instructions and this book has so many to choose from. My youngest and oldest and myself had fun with our first creations that well to tell you the truth looked horrible. But as we went page by page we really got a knack for the step by step drawlings. It has 75 animals in the categories of wild, aquatic, woodland, and farm, and pets. So you are sure to find something. One of the best things I think a family could do with this book to start out with is make it a game. Everyone picks an animal to draw and then others try to figure out what it is. I also really enjoyed how the last picture of each animal was in color so you kind of had an idea on what to do with it. Do I Recommend this book? I recommend this one to all ages! Go Into This One Knowing: Drawling Fun!